This summer I decided to spend the month of August working as a volunteer at a donkey sanctuary in Northern Spain. 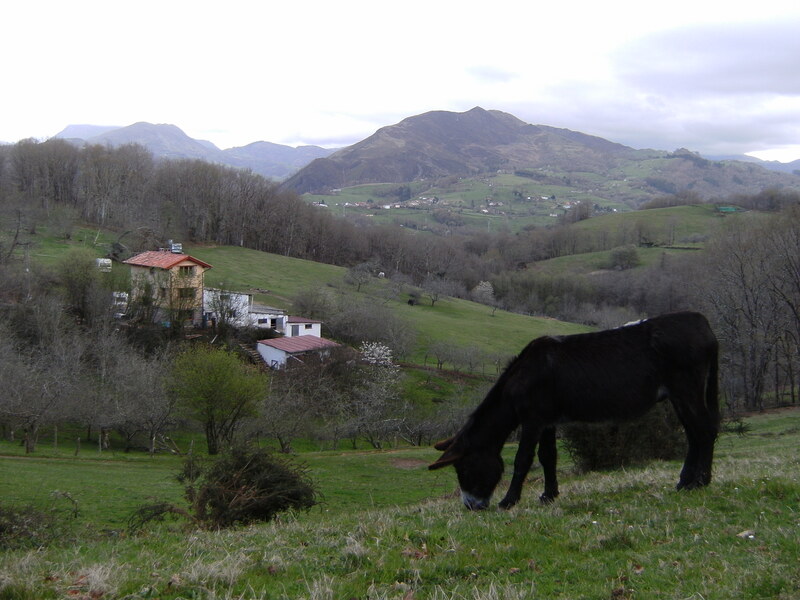 El Paraíso del Burro or ‘Donkey’s Paradise’ was set up 3 years ago in the province of Asturias and is situated in the rolling green pastures that form the foothills of the Picos de Europa mountains. The inhabitants of this verdant paradise are twenty donkeys, most of who are suffering from the effects of previous overwork or neglect of one sort or another. I arrived at the sanctuary to a warm welcome from the founder Marleen Verhoef and the other volunteers who work there. We sat down to a delicious lunch outside on the terrace and I was introduced to some of the donkeys who came to the gate to see who had arrived. The first donkey I encountered was Juliet who lurched from side to side as she advanced towards me. Her dislocated shoulder blades seemed to stretch the skin of her chest almost to breaking point. Amazingly she managed to walk about and lead a pretty normal life at the sanctuary. Before she came here, she had been used to carry incredibly heavy weights which eventually took its toll on her body. A few days into my stay, I was invited to come along to pick up a new arrival in the donkey trailer. Down the end of a narrow grassy track we stopped outside a ram shackled stone shed. Inside it was dark and the ceiling had the most impressive drapery of dusty spider’s webs I have ever seen. Huddled on the floor in the corner was a large white donkey that blinked into the light as she was brought outside by her owner. He didn’t want her any more as she had become so disabled he was unable to work her. We brought her back to the sanctuary and watched her limping out of the trailer, hardly able to take a step because her back hoof had grown under and become deformed. We set to and washed her stained and encrusted fur that had layers of caked-on dung from where she had been lying down in her filthy stable. When the farrier came a couple of days later he looked at her hoof and tutted. He said it looked like her tendon was overstretched from years of misuse and that he probably wouldn’t be of much help. But he trimmed all of her feet, leaving the damaged one till last. Then, as he let her loose, a miracle occurred, and she literally walked away normally without limping. We all cheered and whooped with joy and the farrier swore in Spanish and said he’d never seen anything like it. As she didn’t have a name yet, we decided to call her Linney after one of the volunteers. Another donkey that was brought here during my stay was Sammy. He lived on his own in a small paddock and seemed to be pretty well cared for. His owner had used him to work in the fields but didn’t need him any more. He was very overweight and had a seriously crested neck that flopped to one side and fat pockets on his back and rump. 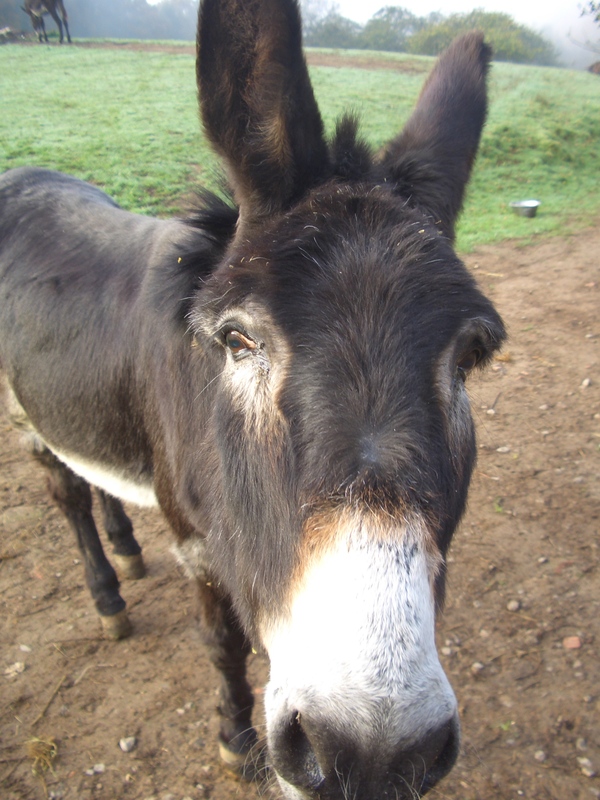 Spanish farmers often feed their donkeys on large quantities of stale bread which doesn’t help to keep their weight down. When Sammy arrived at the sanctuary the dentist took a look at a strange lump in his cheek and decided to extract a tooth that was evidently causing the bulge. Ten minutes of twisting and pulling and out came a bloody tooth with an enormous root attached the size of my finger. Poor Sammy was as good as gold, but the whole operation made me feel so queasy I had to sit down. I got to know all the donkeys by name after a couple of weeks and enjoyed watching how they interacted as a group together. It was amazing to see Linney trotting around the field, interacting with the younger donkeys and taking an interest in life again. Sammy was also accepted into the group although was chased off by some of the females who found him a bit of a cheeky young upstart. – An organization that promotes awareness of working donkeys and runs a weekly donkey delivery service taking groceries around the village of Chalford, Gloucestershire. Lots of great pictures for those of you who don’t speak Spanish and many happy memories for the English speaking volunteers.